Those nasty chin hairs! They can be dark, coarse and wirey. So many women get them as they get older. There are a number of ways to remove them. All hair removal methods have their good points and bad points, however. Most involve a bit of pain. No pain, no gain! Shaving cuts the hair off at skin level. It is quick and easy, but the problem is, those coarse hairs are sharp and stubbly. That's not the way we want our faces to feel. Tweezing pulls the hair out from the root so it has to regrow. The problem with tweezing is the hair needs to grow long enough to be pulled with tweezers. Many women end up with sore torn or pinched skin from trying to get hairs that are just too short. There is a little pain when pulling the hair. Tweezing will discourage hair growth over time. Like tweezing, hairs need to grow in order to be pulled out by the wax. The hair needs to be at least 1/8". Pulling hair out does hurt a little. Waxing too, discourages hair growth over time. Sugaring is like waxing. A sugar and water concoction is heated to a gel like consistency, applied to the skin and pulled off removing the hairs. It does not stick to the skin as much as wax. The hair needs to be at least 1/8". Pulling the hair out does hurt a little. 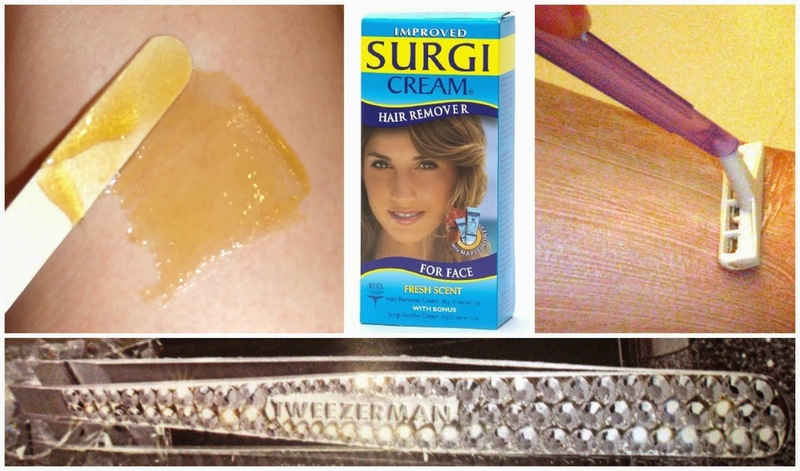 Sugaring will also discourage hair growth over time. Depilatories are chemicals that break hairs off just under the skin leaving the skin feeling smooth. Surgi Cream is a gentle one for the face. You can get it at Sally's Beauty Supply, Walgreens, Drugstore.com, etc. Apply to the chin, leave it on 3-4 minutes and wipe off. The disadvantage is some people are sensitive to it and feel burning or get a rash. Laser hair removal is great for removing dark hairs. It will not get the light colored hairs. It is a long lasting type of hair removal. The disadvantage is the cost. It involves a little pain but its worth it. It is expensive and you need several treatments to remove the hair. Hair can return over time. IPL treatments use light to destroy the root of the hair. This is a also a long lasting but not permanent type of hair removal. The disadvantage is the cost and it also involves a little pain. It is expensive and you need several treatments to remove the hair. Hair can return over time. Electrolysis removes the hairs by electric current. A fine needle is inserted into the hair follicle and the current is activated. The electricity destroys the papilla, the area where the hair gets it's nourishment to grow. No nourishment means no hair. This is the only permanent type of hair removal. The draw backs are, it is painful, time consuming and there is a possibility of minor scarring but it is permanent. Waxing is usually my favorite type of hair removal because it removes a lot of hair quickly and leaves the skin nice and smooth, but I don't like it so much for coarse chin hair. For fine chin hair, waxing works great. Women feel very self conscious letting that hair grow long enough to wax. If the hairs are too short, they end up being tweezed out because the wax couldn't get them. So which removal method is best? I think electrolysis is the best way to go for chin hair removal because it is permanent. It can be time consuming and costly, but the chin is a small area that can be taken care of fairly quickly. My second choice is depilatory. It's not permanent, but it is quick, easy, doesn't require much hair length to do, and doesn't leave coarse stubble or a 5 o'clock shadow.